My card today features the gorgeous Flashy Florals, Thanks & Hello Die-namics, and Scattered Surface Background. I stamped a floral scene and then die cut "thanks" out of it and boosted it up on multiple layers of white die-cut layers. Such a cool effect! very pretty! Love the camouflage die cut sentiment. Lovely card. I did my shopping, now I'm checking out the blogs. Absolutely love the color choices for your card! Great camouflage - almost didn't see the "thanks". Shopped first and now I am seeing so many gorgeous cards I want to order more. That is so cool! Love the colors you used and how you added the "Thanks". Love this technique ... very cool card! Loved the flashy florals kit. Sad I missed it. Hoping the mini ink,cubes are released soon! Oh wow!! I love that fun technique. So pretty!! How wonderfully bold and bright and camouflaged! I love your card! It's absolute perfection. 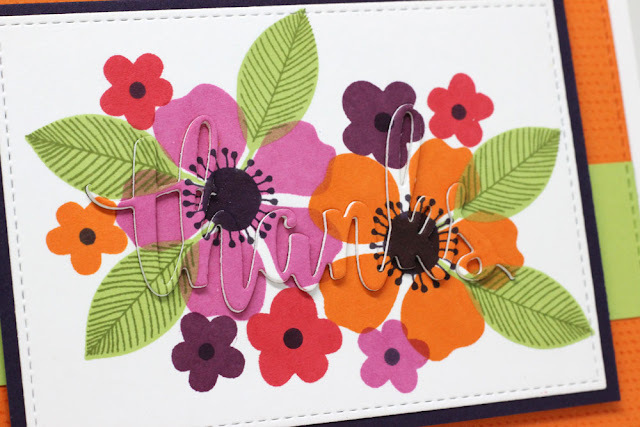 What a clever way to use the die cut sentiment, tucked in among the flowers! Amazing! Love the way you used the die sentiment! Beautiful floral card. Love how you did your sentiment. These flowers are gorgeous! I love how the sentiment is visible, but doesn't take anything away from those beautiful flowers!! Pretty card and happy colors. Love this card - I would never put those colors together, but it really works! Lovely card Jody! Love this release. This is a technique I want to try. Very pretty! Terrific technique. Have to look to see the "thanks". Cheers. Sweet! Love the inlaid sentiment! Love the card design and the colorful flowers! I like the bright and cheery colors. Fabulous! Love how you die cut the "thanks" and popped it up. Love the colors, the scattered background and the camouflage sentiment. What a cool idea to place the word inside the image! Love the Chameleon sentiment, very clever! Really pretty how you die cut the word thanks out of the floral background. Fabulous card with awesome colors! Love the 'thanks' die in the design! Have to try that... fabulous look! Love the flowers and how subtle the sentiment is! Love these flower sets & yours are so vibrant. Beautiful card and love the way you've done the sentiment. Fabulous release. Wow what a cool technique! I love the bright colors too. Love the "thanks" peeking out of the flowers! Gorgeous card! Love all the summer colors on your card. Anything floral is going to be a hit. What a fun card - love you color palette and how the die pops out! Great idea!!! Love the die cut sentiment within the flowers! This is a great technique that I love especially with florals. That flashy florals is pretty and I am glad to see it in the July release. seriously gorgeous card!! love the bold, bright colors! This technique is so cool! Those flowers are gorgeous! So bright & beautiful--just love this card! Ohhh, that's so pretty the way the "thanks" pops out. Love the vibrant colors. Very nice. Wow! I love that technique where the wording blends in with the card! gorgeous card, love this technique...congrat's on 10 years !!! Fabulous card! Love this technique! 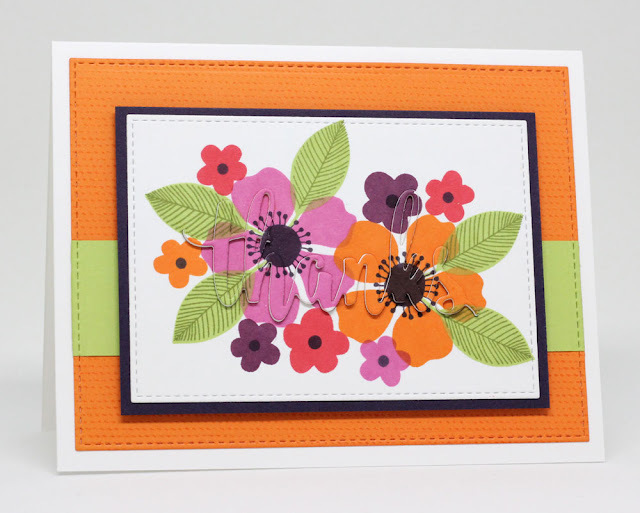 Fun color combo and pretty floral stamps!